With so much information available in the media offering tips and advice on how we can reduce the risk of crime on our property, it’s no wonder we are so vigilant when it comes to making sure the main exit doors are locked and secure when we go out during the day and at night. But our preoccupation with securing the front and back doors means we often forget to think about other areas around our properties that are just as vulnerable. For example, sometimes valuables in our gardens are more at risk than the contents of our house. This is because many of us don’t consider locking our garden gates (especially if we live in a rural area), making our gardens an easy target. Sheds, garages, summerhouses, home offices and other outbuildings are attractive targets for opportunist thieves due to the value of their contents. Securing these areas with a lock and key is a good idea, but it’s not always easy to remember to lock them. How many times have you lost the key to the garage or the shed? Or left a key in a trouser pocket and then put the trousers in the wash? You can fit the most secure lock in the world, but if it’s left unlocked, it may as well not be there. Installing a keyless digital lock is one solution to help overcome the problem of leaving doors unlocked. Access is obtained by pushing buttons on a keypad instead of using a key. This is great news for households with teenage children who seem to have an uncanny ability to lose keys. With a digital mortice latch lock, once the code is entered the door can be opened and will relock automatically when closed. Problem solved. Anyone seen the shed key? 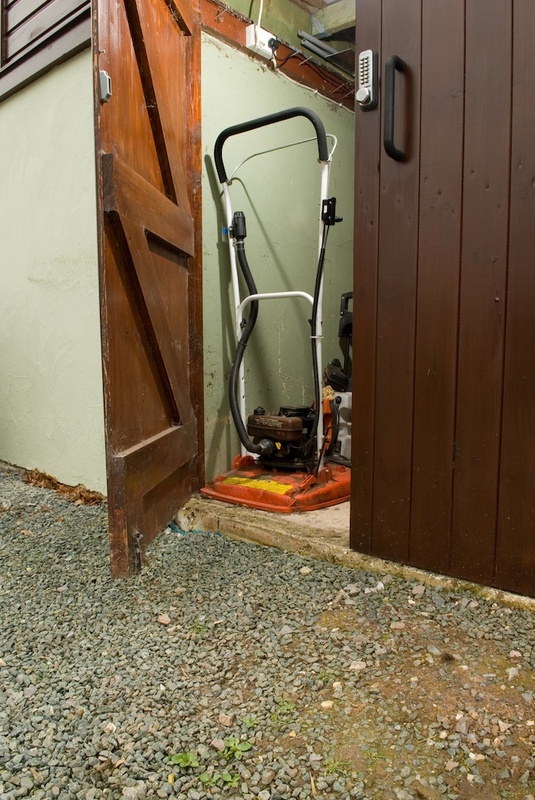 Protect the contents of your shed with a digital mechanical keypad lock. There is a wide range of reasonably priced mechanical digital locks available for all types of doors on sheds, gates and garages. The locks come with different mortice latch and deadbolt options, and have either a knob or lever handle. Mechanical digital locks are easy to install and easy for the whole family to use, as they operate with a single code that can be changed prior to fitting or by removing the lock from the door. Some mechanical digital locks come with a code-free option, so if ‘in and out’ access is required during the day – like it would in a home office for example – then mechanical digital locks can be set to allow code-free access. If you don’t want the hassle of having to remove a mechanical lock from the door in order to change the code, consider an electronic code lock instead. These can be used as the primary lock on doors for outdoor offices and summerhouses, for example, and offer much more in terms of functionality. The on-door programming feature makes the product much easier to manage on a daily basis. Digital keypad locks are weather resistant and require little maintenance. We recommend you use a silicon spray every now and again, wiped over with a cloth, to help keep the locks in tip-top condition. To view our full range of digital keyless access products for the home visit our website. ← Need help installing or programming a digital door lock? Codelocks technical support team is just a call away.